Q: What does the window cleaning in Whitechapel include? standard internal window cleaning with ladders and sponges. Q: Who will clean my panes? A: Our service will be conducted by experienced and background-checked Whitechapel window cleaners. They'll also wear branded uniforms, so you'll easily recognise them as soon as they appear near your property. A: Basically, this is a telescopic rod that shoots water under strong water pressure. It allows the experts to reach the fourth floor of any business or residential building without having to climb the rooftop. Q: Will you connect your gadget to my property's water source? A: Not at all! The experts will use a special de-mineralised water tank inside their caravan. However, if the tank is empty, we will happily welcome your offer. Q: Are there any demands that I should meet ahead of time? A: You must make sure that there will be a free parking slot within 30 metres from your property and on the same side of your windows. The experts also need to have a free access to your property. For the last decade, our window cleaning Whitechapel service has always brought satisfactory results at the most fair prices in your region. You can browse our fees in our short price table below. Based on your needs, our window cleaning Whitechapel can offer you with three options. 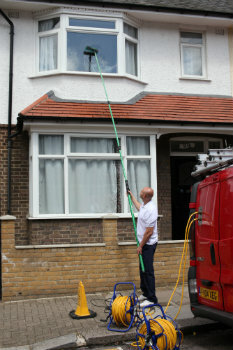 If you choose exterior cleaning, the experts will deploy a special water-fed rod. This gear can expand up to 22 metres in length, which is identical to the height of a four-storey building. The Whitechapel window cleaners will use distilled water under high pressure that will blast away all stains in little to no time. If you own a lofty property instead, then opt for our rope access window cleaning. There, a team of licensed abseilers will methodically shine your windows until they spot the mirror image of the setting sun. For your peace of mind, we inspect the washing equipment on a frequent basis and can provide COSHH reports at your request. For internal cleaning, the professionals will bring ladders and squeegees to ensure that even the highest places will get proper treatment. In our aim to aid as many Londoners as humanly possible, we've broadened our window cleaning in Whitechapel to encompass extra locations across London. For your convenience, we've listed the names of these close by locations below. For those of you who'd rather book window cleaning services Whitechapel E1 online, fill in our get a free instant quote form.